1. Humour works – Life is already too serious. Injecting humor into serious topics (like crime, poverty and the likes) could make your presentation a lot more bearable and interesting. 2. Short and simple – No matter how complicated your topic is, make is short and sweet. 3. Credible information – Always based your claims on facts and proofs. 4. Videos & images – use videos and images to support your presentation and to make it more interesting and engaging. 5. Passion – When you are passionate about what you preach, it will shine through and people will believe you more and see you as more credible. Eye contact is essential in communication. We do it daily and naturally when conversing with family and friends. But the moment we speak in front of a large crwod, we seem to forget how. Below are 12 tips you can use to make sure that you maintain good and proper eye contact when speaking in front of many people. Warm up early to the audience. Get closer to audience members. Express emotion with your eyes. Ensure eye contact as you deliver all critical lines. Sustain eye contact with someone for a few seconds, then move on. Connect with your audience’s eyes, if possible. Focus on the audience member during Q&A. I have shared with you a lot of presentation tips in the past. But these top ten presentation lessons below seem to be the simplest, yet most crucial if you want to improve your craft in presentations and public speaking. The lessons came from this video which I found awesome and quite funny. 1. Arrive early to prepare. – I’ve always mentioned this before. Arriving early gives you a chance to not just prepare your materials and tools, but it will also help you relax thereby making you more ready and positively energized for your presentation. 2. Your opening is always crucial. – The first few words that come out of your mouth can actually make or break you. They will either impress your audience and catch their attention instantly, or they can cause you to be judged very harshly by your audience. 3. Don’t make fun of your audience or any member of your audience. – This is common sense. 4. “Juvenile slide transitions to spice things up” only make you look unprofessional. – The simpler your PowerPoint presentation is, the better. Just stick to fade or wipe for transitions. 5. Don’t read your slides. 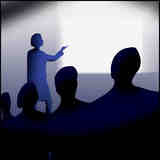 – Doing so is like disrespecting the effort, time and money your audience spent to be able to attend your presentation. They can read the slides on their own. What they need from you is more insight and wisdom which shows that you are an expert or person of authority in your chosen topic. 6. Practice makes perfect. – Same essence as number five. If you respect your audience and the time and resources they spent to come see you, then you will prepare your speech or presentation very well. 7. Avoid using clip art. – It will only show your lack or creativity and resourcefulness. 8. Prepare for technical difficulties. – First and foremost, make sure that you have a decent enough desktop background just in case the same thing happens to you. Then be able to handle the technical problem as quickly as possible. Don’t let it derail your presentation. 9. Be careful with lists. – Don’t cram everything on one page and find yourself forgetting a bullet point. It will only make you seem like you were unprepared and didn’t know what was coming next. Divide your bullet points into different pages and insert a photo in there to help catch the attention and interest of your audience. 10. Conclusions are not mere restatements of your title and subtitles. Your presentation doesn’t have to end in Q&A either. You should have a particular closing remark prepared that will en-capsulize everything you have presented. It should also include a call to action. This way, your audience will remember your talk even after the curtain call. I’ve shared with you some tips before on how you can prepare for your presentation. These tips mostly deal with preparations weeks and months in advance. But how about on the few days leading up to your big day? What do you do? More importantly, what should you do? The Night Before – finish your rehearsal early and try to relax. The morning of your presentation – eat a good breakfast and make sure you’re properly hydrated to keep your energy levels up. The minutes before your presentation – mingle with your audience to help you feel more at ease with them. The seconds before your presentation – smile, breathe and deliver your first few words confidently. During your presentation – smile, make contact with your audience and be aware of the speed with which you are speaking. After your presentation – reward yourself for a job well done. Do You Know the Types of Audience Tension? As a speaker or presenter, you must be sensitive enough to know the kinds of tension your audience goes through as they try to focus on your speech, and more importantly, to be able to address those tensions so you can be sure that they will be able to take with them the lessons you intended to share with them in the first place . I remember watching Planet of the Apes this summer and I thought, wow, could that really be possible? I found some scenes too gruesome to watch (or maybe I’m just too sensitive) but other than loving its cinematography and totally sympathizing with Ceasar, I thought, there are some lessons to be learned here when it comes to presentation. So I went about my days, plotting to write about it, then voila… I found another blog post that has the same sentiments. Perfect! Learning doesn’t have to stop. Just look at how those chimps and apes were able to adapt to their new surrounding and eventually plotted their escape. You have to scope your environment, your audience, your market too. Don’t be overly ambitious. Sometimes, you have to be patient by taking steps one day at a time until you can perfect your presentations. Practice, practice, practice. Learn from your mistakes and keep moving on one day at a time. Always build bridges. See how Ceasar had to make friends with his supposed enemies? Always connect and network and never burn bridges. You never know where it might lead you. To read more about Scott’s blog post, head to Presentation Lessons from Planet of the Apes.